Cedarburg, WI. LSR has announced two extensions to its Sterling line of Wi-Fi modules, the Sterling-LWB5 dual-band 802.11 a/b/g/n/ac Wi-Fi + Bluetooth Low Energy (BLE) module based on the Cypress Semiconductor BCM43353 chipset, as well as the Sterling-LWB for WICED reference platform based on the Cypress BCM4343W that supports embedded Wi-Fi and BLE developers. Both solutions are well suited for wireless systems that require a microprocessor capable of running Linux-based operating systems (OSs). The Sterling-LWB5 is one of the first commercially available IEEE 802.11ac-certified modules and enables 5 GHz Wi-Fi connectivity, while the Sterling-LWB for WICED platform continues to support the WICED software development kit (SDK). The Sterling-LWB5 comes in three different configurations each specified to -40 ºC to +85 ºC temperature ranges, including a 10 mm x 10 mm system-in-package (SiP) design and two 15.5 mm x 21 mm configurations that can be equipped with an on module antenna or external antenna via U.FL connector. 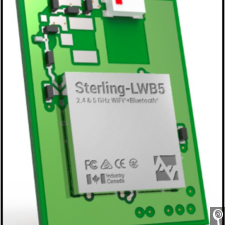 The on-module antenna and U.FL variants of the Sterling-LWB5 will be pin compatible with the board’s predecessor, the LWB, and antenna certifications are available for use in the U.S., Europe, Japan, Canada, Australia, and New Zealand. The Sterling-LWB for WICED enables the creation of Wi-Fi and BLE designs in the 2.4 GHz band, and allows developers to leverage the STM32F411 microcontroller (MCU). The reference platform includes a carrier board that is directly pluggable with the STM32F411 Discovery Board for advanced prototyping, access to the ModuleLink mobile app for evaluating wireless commissioning, and a free TiWiConnect IoT platform developer account for proofing Wi-Fi-to-cloud connectivity. Both the Sterling-LWB5 and Sterling-LWB for WICED will be available by the end of the year, with prices starting at $16.99 in 10,000 unit quantities for the former and $79 each for the latter. 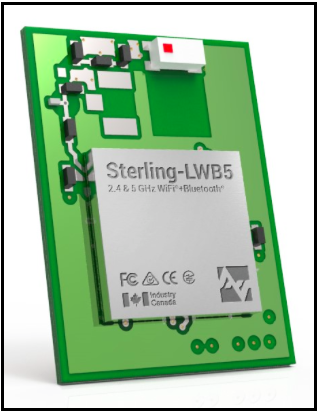 For more information, visit https://www.lsr.com/embedded-wireless-modules/wifi-plus-bluetooth-module/sterling-lwb5 and https://www.lsr.com/embedded-wireless-modules/wifi-plus-bluetooth-module/sterling-lwb, respectively.